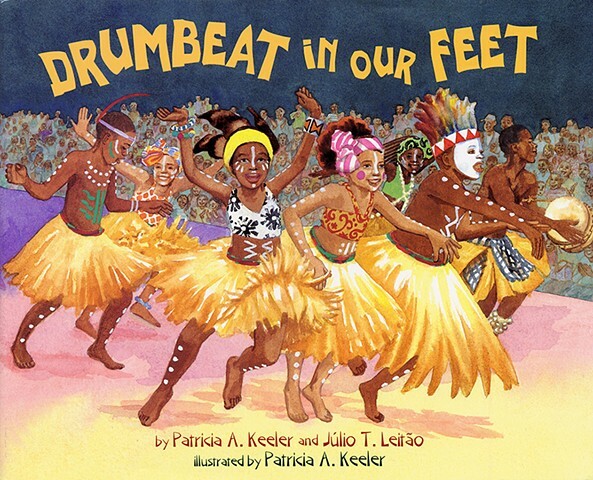 The authors honor the Batoto Yetu dance troupe and celebrate African dance in this uplifting picture book. Julio T. Leitao founded the troupe in 1990. Children from all over the New York City area arrive at the dance studio where their teacher leads them in songs, drumming and dance. The meanings of the dances are reflected in traditional dress, masks and body paint as they prepare for a show. As the children learn the steps, they also learn history and embrace different cultural traditions. Keeler's layout features background information in the left margin of colorful two page spreads. She portrays an African dance class to the right. As the children prepare for a performance, facts about the origins of different types of dances, costumes, and musical instruments accompany vivid illustrations of students leaping and stepping through traditional dances. Additional information about Batoto Yetu, which means "our children" in Swahili, rounds out the book with photographs of young performers. A map of the African continent helps orient the reader and a pronunciation guide and author's sources are included.